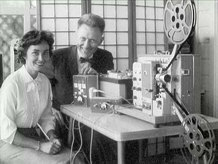 In 2005, the CFA was awarded its first grant from the NFPF to preserve Fairy Princess (1956), a short film by amateur moviemaker Margaret Conneely that was named one of the Photographic Society of America’s “Ten Best” films of 1956. In the ensuing 10 years, the CFA has preserved 23 additional films through our grant program, all of which—with the exception of their most recent projects—are available for viewing on their website and YouTube channel. Highlights include DeWitt Beall’s Lord Thing (1970), a fictionalized account of the political transformation of the Chicago street gang the Vice Lords that was rescued from VHS obscurity when the CFA discovered 16mm prints of the film in the care of Beall’s widow. Like many archives, the CFA can’t afford film-to-film preservation for every title in its collection, but in the meantime all of the films are kept stabilized in climate-controlled vaults and many of them have been uploaded to its YouTube channel. With some 1,500 films available for viewing—from home movies of the 1933 Chicago World’s Fair and playing Frisbee in Grant Park in 1973 to dance films by Ruth Page and TV commercials from the 60s—the CFA deserves special recognition for its commitment to public access. The CFA’s engagement with the local community can also be seen in their public events, which include outdoor screenings, collaborations with local musicians, and its CFA Crashers series which invites outside programmers into the vaults to curate a program. For a more in-depth profile of the CFA, check out this excellent article that appeared in the Chicago Reader last year. To keep up to date about their latest projects and activities, follow them on Facebook. And if you live in New York, be sure to check out the Larry Janiak retrospective at Anthology Film Archives on Sunday, July 19th. It includes brand new prints of three films recently preserved with NFPF support. CFA Collections Manager Anne Wells will be in attendance to introduce the program. 8 Flags for 99 Cents (1970), Chuck Olin’s profile of a Chicago blue-collar community and the Vietnam War. Black Moderates and Black Militants (1969), discussion between two African Americans—a Black Panther Party member and high school principal—on how to promote social change. Cicero March (1966), film documenting an African American protest march through a white suburban neighborhood. The Corner (1963), profile of the Vice Lords, a Chicago street gang. Fairy Princess (1956), stop-motion animation by award-winning amateur filmmaker Margaret Conneely. I’ve Got This Problem (1966), Don B. Klugman’s satiric short tracing the relationship of a young couple. Law & Order Versus Dissent (1969), one of four films by the Film Group exploring the final two days of the 1968 Democratic National Convention. Lord Thing (1969), fictionalization of the rise of the Vice Lords gang in Chicago. A Matter of Opportunity (1968), Chuck Olin film, shot at Howard University Hospital and sponsored by two professional associations, about opening up medicine to African Americans. Mi Raza: A Portrait of a Family (1973), cinéma vérité study of the daily life of Mexican-American immigrants. Nightsong (1964), Don B. Klugman’s portrait of the Chicago Near-North folk club and nightlife scene. The People’s Right to Know: Police Versus Reporters (1968–69), Chicago Film Group’s look back at the confrontations between police and demonstrators at the 1968 Democratic National Convention. Police Power and the Freedom of Assembly: The Gregory March (1969), one of four films by the Film Group exploring the final two days of the 1968 Democratic National Convention. The Right to Dissent: A Press Conference (1969), one of four films by the Film Group exploring the final two days of the 1968 Democratic National Convention. Social Confrontation: The Battle of Michigan Avenue (1969), one of four films by the Film Group exploring the final two days of the 1968 Democratic National Convention. You’re Putting Me On (1969), Don B. Klugman’s film following a Chicago couple who “psychoanalyze” their relationship en route to a swinging sixties party.